Over the last few years, I've grown to love Sriracha. It's a fermented hot sauce from Thailand, and it's delicious. It's also tangy, red, and very spicy. 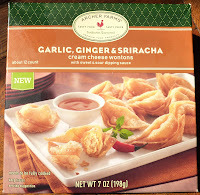 But I'm not sure what it has to do with this product, because these appetizers taste nothing like the Sriracha I know. There's a hint of spiciness, but it's not even a fraction of the heat from one teaspoon of Sriracha. garlicky, salty, tangy, and creamy all at the same time. It's an extremely complicated conglomeration of essences all coming at you at the same time. I thought it would be less confusing for my poor tongue if I tasted just the wontons without the sauce. And it was. But I definitely like them better with the sauce. It's like shock and awe for the tongue. You have to be pretty open-minded to try and enjoy something like this. The closest approximation I can think of might be the Habanero Lime Wontons. Not that they taste the same as these wontons, but both products are uncategorizable, unique, and pretty tasty. I know I've been stuck giving every product a 7 or an 8 for quite a while now. And I'm torn between the two for these things. I think I'll go with a 7, just because I think I'd take the aforementioned Habanero Lime dealies over these guys. But I suppose you might like these better if'n you consider yourself a garlic kinda person as opposed to a habanero kinda person.